The Black History program is an annual luncheon that encourages the local senior community to join together, celebrate diversity, and learn about the African-American culture. Every year we celebrate Black History Month with special guests who share the influence of African-American Culture in society. 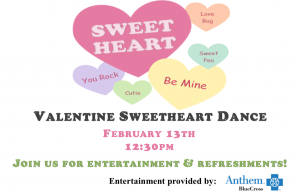 All guests are invited to wear their favorite African-American attire! This year's program will highlight the "Little Known Heroes" of the All Black 25th Infantry Bicycle Corps. Let’s make a MOVE towards Better Health! Join us for 20-min educational/exercise demos, try something new, and maybe find your new favorite fitness class. 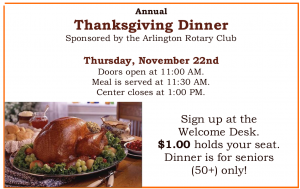 Our Annual Thanksgiving Dinner is here. Sign up at the Welcome Desk. Dinner is for Seniors (50+ ) Only $1.00 holds your seat . We would not be able to do what we do without our 300+ volunteers. They work so hard throughout the year to aid the Foundation & Center in its daily activities and special projects. 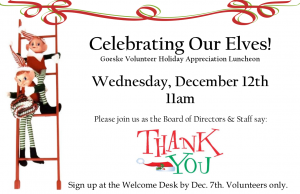 The annual Volunteer Appreciation & Holiday Luncheon is a small way for the Foundation to say "Thank You" and serve our volunteers for a change. We had a great time at last year's event, celebrating our volunteers and the 30,000+ volunteer hours they donated in 2017. The Black History program is an annual luncheon that encourages the local senior community to join together, celebrate diversity, and learn about the African-American culture. Every year we celebrate Black History Month with special guests who share the influence of African-American Culture in society. 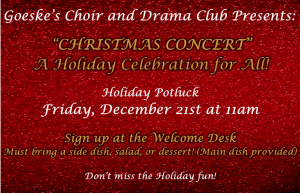 All guests are invited to wear their favorite African-American attire! This year's program is "A Celebration of Innovation: African American Inventors Who Changed The World."